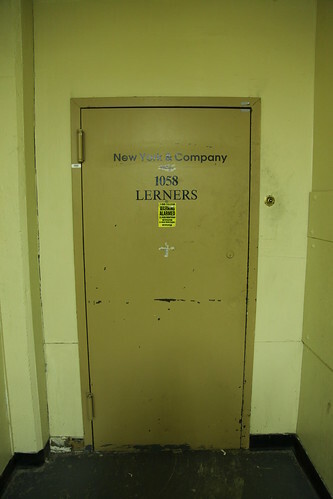 Lerners and New York & Company are one in the same, so it's no surprise that they simply re-labeled the door when re-branding. What's ironic though is that although it's hard to tell from the photo, if you look closely, there are actually two "warning: alarmed" stickers on the door. I guess when they re-labeled the door, they'd brought a second alarm warning label with them also, but since the label was already on the door, they just slapped the new sticker on over the old sticker (although they didn't align them at all, creating the overlapping effect).